There are 21 Memory Care Facilities in the Fernandina Beach area, with 2 in Fernandina Beach and 19 nearby. The average cost of memory care in Fernandina Beach is $4,647 per month. This is lower than the national median of $4,650. Cheaper nearby regions include Amelia Island with an average starting cost of $3,560. To help you with your search, browse the 7 reviews below for memory care facilities in Fernandina Beach. Better rated regions include Jacksonville with an average rating of 4.3 out of 5 stars. Caring.com has helped thousands of families find high-quality senior care. To speak with one of our Family Advisors about memory care options and costs in Fernandina Beach, call (855) 863-8283. About 540,000 seniors in Florida are living with Alzheimer's disease, and that number is expected to grow, according to the Alzheimer's Association. More than 30 percent of Fernandina Beach's 12,000 residents are aged 65 and older, and some of these seniors may fall into this Alzheimer's disease population. For these seniors, living in one of the area's 23 memory care facilities can provide them with the care they need. Memory care facilities in Florida represent one category of assisted living facility. 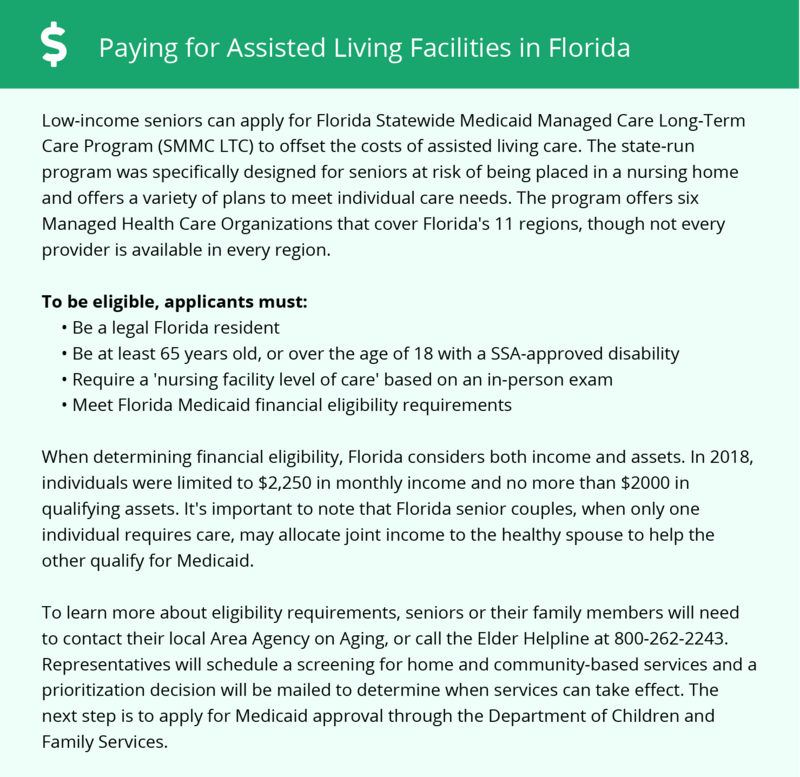 The Florida Department of Elder Affairs oversees and licenses all facilities in the state. Memory care facilities must meet additional training requirements to ensure that they provide optimal care for those seniors with dementia. Fernandina Beach sits on Florida's North Atlantic Coast. In addition to its scenic coastal location, the city also offers an appealing climate to seniors who want to escape cold and snowy winters. January lows hit the mid-40s, and July highs reach the upper 80s. The city sees no snow, more rain than average and more sunny days than average. It will cost seniors more to live in Fernandina Beach than other locations. On a scale where 100 represents the national average, Fernandina Beach's cost of living comes in at 129.8. Memory care facility expenses, however, are lower than the national median. Seniors can see some tax savings thanks to Florida's tax-friendly status. The state has no state income tax. As a result, it also does not tax social security income. Families budgeting for memory care facility in Fernandina Beach should should keep these tax savings in mind. Violent crime rates in Fernandina Beach are lower than average. Property crime rates are slightly higher than the national average. As a result, seniors' families may want to inquire about security features, such as door locks and exterior lighting, at memory care facilities. Memory Care costs in Fernandina Beach start around $4,647 per month on average, while the nationwide average cost of memory care is $4,799 per month. It’s important to note that memory care rates in Fernandina Beach and the surrounding suburbs can vary widely based on factors such as location, the level of care needed, apartment size and the types of amenities offered at each community. Fernandina Beach and the surrounding area are home to numerous government agencies and non-profit organizations offering help for seniors searching for or currently residing in an assisted living community. These organizations can also provide assistance in a number of other eldercare services such as geriatric care management, elder law advice, estate planning, finding home care and health and wellness programs. To see a list of free memory care resources in Fernandina Beach, please visit our Assisted Living in Florida page. Fernandina Beach-area assisted living communities must adhere to the comprehensive set of state laws and regulations that all assisted living communities in Florida are required to follow. Visit our Memory Care in Florida page for more information about these laws.